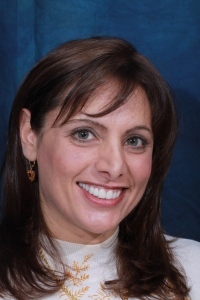 Joelle initially came to see us to establish a relationship with a new dentist. It was an informal approach, for routine dentistry. But Joelle actually was interested in improving her smile and felt more comfortable seeing us this way---basically to check us out. She told us how self-conscious she was about her smile and that she'd never really done serious research to find the right dentist to help her. Joelle is naturally reserved; not someone who would be aggressive or forceful about her quest. She's also basically a happy person and doesn't question things intensely. With her relaxed approach, Joelle really hit it off with Dr. Mello and finally confided how unhappy she had been about her smile. The most visible cause was her missing front tooth that had previously been replaced with a Maryland bridge--a bridge that replaces a missing tooth with a replica attached to the back of the teeth on either side of it; using two wings to keep it securely in place. 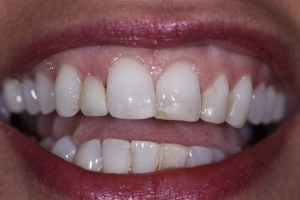 The Maryland Bridge is a good option only under certain circumstances: for instance, it works better on bottom front teeth, but not as well on top--and the adjacent teeth that the Maryland Bridge attaches to have to be cosmetically in great shape. Another problem with these bridges is that its wings are usually made out of metal; their silver color is reflective and can look grayish. We discovered that Joelle also had several front teeth (including her remaining front tooth) whose earlier bonding had become discolored, requiring cosmetic correction. Our plan for Joelle included replacing her Maryland Bridge with a new porcelain bridge, and placing matching veneers on three other teeth, for a total of six. Because we were able to encourage her to confide her feelings about what she hoped to accomplish in treatment, Joelle (who had never believed she could have such a beautiful smile) told us afterward that she was extremely excited about the final results. She now feels more confident and doesn't think twice about smiling.